Friends of Family Planning Art Show Gala 6 to 8 pm at the Ag Hall in West Tisbury. Annual benefit show opens with preview party: live music, hors d’oeuvres, $50. Show continues through Sunday, 10 am to 6 pm. Friends of Family Planning Art Show 10 am to 6 pm at the Ag Hall in West Tisbury. Local art show benefits Family Planning of Martha’s Vineyard. Show continues through Sunday. Spring Artisans Festival 10 am to 4 pm at the Grange Hall in West Tisbury. Island artisans sell furniture, jewelry, art, ceramics, and more. Free parking & admission. Food for sale. Also Sunday. vineyardartisans.com. Season Opening Reception at Dragonfly Gallery 4 to 7 pm, Oak Bluffs. 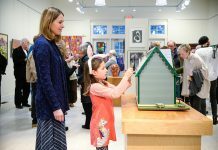 Gallery celebrates 20th season. Work by many artists in oil, acrylic, mixed media, and more. 508-693-8877; mvdragonfly.com. 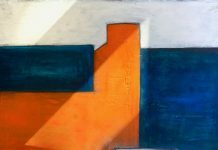 Exhibition Reception with Jill Soukup 6–8 pm at Eisenhauer Gallery in Edgartown. Music by Johnny Hoy. eisenhauergallery.com. Opening Show at Groovy Sue Gallery 2 to 7 pm, Oak Bluffs. New works by Suesan Stovall. 323-842-1076. 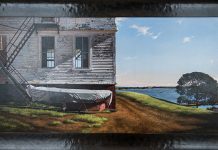 Art of Martha’s Vineyard at Louisa Gould Gallery 5 to 7 pm, Vineyard Haven. Show runs through July 17 featuring an artist per week. 7:30 pm: live performance by Riverheart. 508-693-7373.